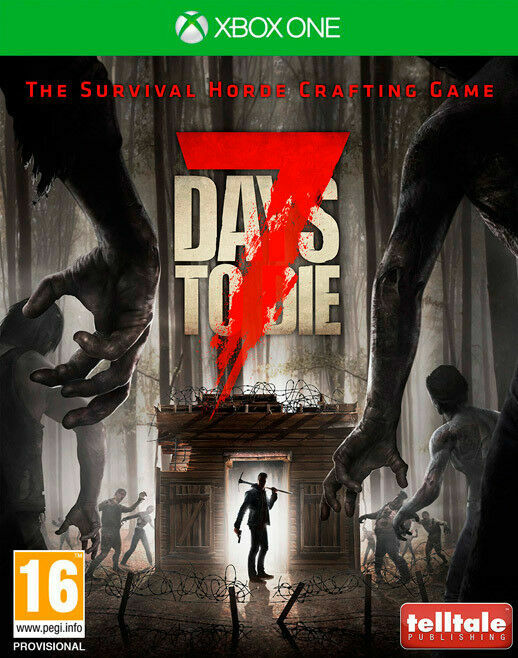 Hi, I’m interested in Xbox One 7 Days to Die (brand new). Please contact me. Thanks! Respond via e-mail, whatsapp or by calling. SMS REPLIES WILL BE DISREGARDED. Trades for Xbox 360 / Xbox One / PS1 / PS2 / PS3 / PS4 / Switch / Vita / Wii U / DS & 3DS games welcome. We can deliver for a fee depending on your delivery address. PLATFORM: XBOX ONE AND THE GAME IS BRAND NEW, SEALED, SELLING IT AS ITS AN UNWANTED GIFT. Welcome to Hope County, Montana. This idyllic place is home to a community of freedom-loving people - and a fanatical doomsday cult known as The Project at Eden’s Gate. Led by the charismatic prophet Joseph Seed and his devoted siblings – The Heralds - Eden’s Gate has been quietly infiltrating every aspect of daily life in this once-quiet town. When your arrival incites the cult to violently seize control of the region, you must rise up and spark the fires of resistance to liberate a besieged community. Freely explore Hope County’s rivers, lands, and skies with the largest customizable weapon and vehicle roster ever in a Far Cry game. You are the hero of the story in a thrilling world that hits back with every punch, and where the places you discover and the locals you ally with will shape your story in ways you’ll never see coming. Stranded in hostile territory, find strength in the community around you to lead a resistance against a cult taking over Hope County, Montana. Meet a lot of memorable characters including Mary May, local saloon owner; Nick Rye, family man and plane enthusiast; and Pastor Jerome, a preacher whose flock has been led astray. Meet a huge cast of memorable characters including Mary May, local saloon owner; Nick Rye, family man and plane enthusiast; and Pastor Jerome, a preacher whose flock has been led astray. - Recruit Guns for Hire and leverage the special skills of up to 3 at a time to turn the tables on The Project at Eden’s Gate. - Command specialized Fangs For Hire, animals you can control to support any playstyle. - Ally with a Friend For Hire to take down the cult in a two-player co-op experience that extends across the full campaign. The freedom to go in any direction you decide the when, the where, and the how. - From the moment you enter Hope County you have the freedom to tackle the world in any order you choose. - For the first time in Far Cry, you are the hero of the story – choose your own avatar and customize your character. - Create insane and unique Far Cry experiences with the Map editor, to enjoy with or against your friends! Play your way against Joseph Seed and his fanatical followers in a dynamic open world that adapts and reacts to the choices you make. - The Resistance Meter evolves the world in meaningful ways as you progress; every action you take moves your story forward. - Disrupt the cult’s doomsday preparations to draw The Heralds into epic showdowns in the open world. - Your choices affect the world as new gameplay opportunities arise from the chaos. - Experience The Mysteries Of Ancient Egypt: Uncover Lost Tombs, Explore The Pyramids, And Discover The Secrets Of Mummies, The Gods, And The Last Pharaohs. PLATFORM: XBOX ONE AND THE DISC IS IN MINT CONDITION WITH NO SCRATCHES OR CRACKS. THIS TITLE MAY REQUIRE ACCESS TO A BROADBAND INTERNET CONNECTION. Frostbite unlocks a whole new world of possibilities for the FIFA franchise and its fans. We have never been as excited as we are today about the future of football and the experiences we are going to deliver in FIFA 17. FIFA 17 also introduced four new football ambassadors who have influenced complete innovation in the action on the pitch. James Rodriguez of Real Madrid C.F., Anthony Martial of Manchester United, Eden Hazard of Chelsea FC, and Marco Reus of Borussia Dortmund are four world-class attacking footballers who are capable of changing any game. They all worked with EA SPORTS to bring to life the gameplay innovation which will be revealed at EA Play. The ambassadors also appear in the FIFA 17 pre-order offer as loan players in FIFA 17 Ultimate Team.